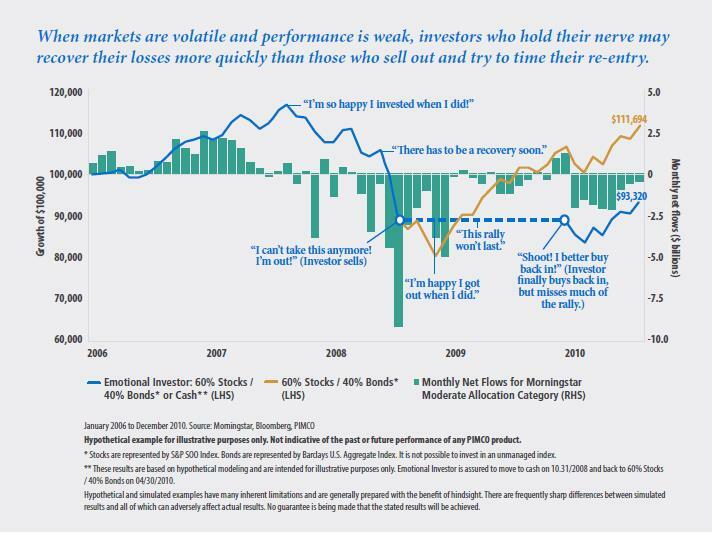 Most investors will be familiar with the concept that it is “time in the market, not timing the market” that generates solid longterm returns. But many investors find it hard to stay the course when performance turns south, resulting in a detrimental outcome for their portfolio. Take, for example, an investor with a portfolio of stocks and bonds worth $100,000 at the start of 2006. For 18 months or so, the investor would have been pleased as their portfolio grew to more than $111,000. However, this would have begun to change when markets began to head south in mid 2007. The investor holds their nerve for about a year before selling out when their portfolio drops to around $90,000. Whilst sitting on the sidelines waiting for a recovery, they fail to pick the start of the upswing and end up reinvesting their $90,000 late in the rally. By mid 2010, their holding has recovered to around $93,000. The investor holds their nerve through the entire period and never sells down their stock. By the time mid 2010 rolls around, their holding has recovered back to its former high of $111,000. Contact us at Priority1 to discuss whether your investments are right for you.